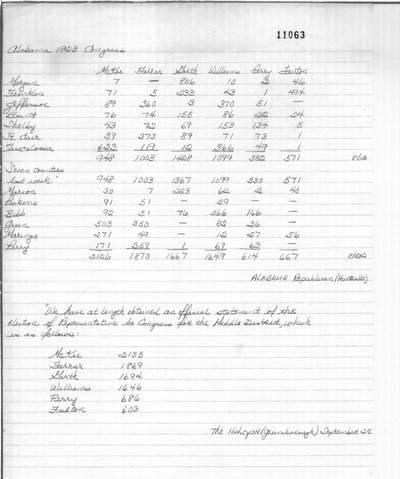 The Alabama Republican (Huntsville, AL) and the Richmond Enquirer (Richmond, VA) list John McKee with 2126 votes, Thomas Farrar with 1870 votes, Jesse W. Garth with 1667 votes, and Marmaduke Williams with 1649 votes. The Alabama Republican also lists Sion L. Perry with 614 votes and John S. Fulton with 667 votes. The Second Congressional District is also referred to as the Middle District. Alabama Republican (Huntsville, AL). August 15, 1823. Alabama Republican (Huntsville, AL). August 22, 1823. Richmond Enquirer (Richmond, VA). August 26, 1823. Richmond Enquirer (Richmond, VA). September 2, 1823. Richmond Enquirer (Richmond, VA). September 9, 1823. The Halcyon and Tombeckbe Public Advertiser (Saint Stephens, AL). September 25, 1823.